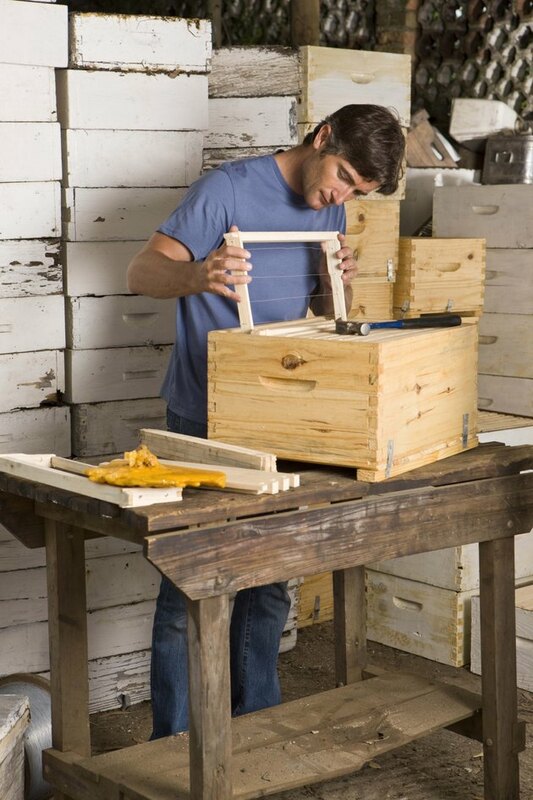 You don't need complex joints to build a wooden box. Simple box construction consists of uncomplicated design and materials such as plywood. Plywood works best for larger boxes that are perfect for storage, toys, shipping or work-related duties. Utility boxes made from plywood are sturdy, affordable and accommodate movement and weight without significant weakening. Add corner bracing, and the box becomes even more durable. Build a heavy-duty plywood box in about an hour using ordinary tools. Dry-fit parts before adding glue. Set the fence on a table saw to the desired height of the box. Cut the 3/4-by-48-by-96-inch sheet of plywood twice, perpendicular to the grain, to produce two identical pieces. Set the fence to the desired length of the box. Cut one of the pieces twice -- parallel with the grain -- to produce the front and back of the box. Set the fence 1 1/2 inches shorter than the desired width of the box. Rip the remaining piece of plywood parallel with the grain twice to produce the sides of the box. Apply glue to the sides of the two smaller pieces. Assemble the four pieces standing up with the shorter pieces sandwiched between the larger pieces, flush on the outside. Place clamps across the box and apply pressure. Drill pilot holes 4 inches apart vertically, through all four corners using a drill/driver and 1/8-inch drill bit. Drill the holes 3/8-inch from the edge to penetrate only through the first piece of plywood. Countersink the holes with a 3/8-inch countersink drill bit. Insert 2-inch screws in the holes. Drive the screws in using a drill/driver. Remove the clamps after one hour. Measure the length and width of the box on the outside. Cut a bottom for the box from the remaining piece of plywood. Apply glue along the outside perimeter of the box. Place the bottom on the box, flushing it on all four sides. Drill pilot holes, countersink and screw the bottom on the box using 2-inch screws. Turn the box upright. Rip a 48-inch-long, two-by-four stud in half lengthwise using the table saw. Measure the depth of the box. Cut four pieces to the measurement using a miter saw using the half-studs. Apply glue to two sides of the four pieces. Place one piece in each corner. Drill pilot holes through the pieces spaced 4 inches apart vertically. Screw them to all four corners on both sides using 2 1/4-inch screws. Measure the top of the box. Cut a lid to the measurement from the remaining plywood. Screw the lid to the box using 3/4-by-3/4-inch piano hinge and 1/2-inch screws.